We offer knobs for some versions of the Zhumell Z8 primary and secondary, along with stronger springs to support the primary mirror. Our knobs will fit if your telescope matches our photos. 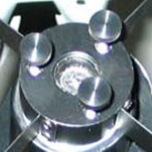 Select the type of knobs/springs for your telescope from the list below. Fits: Most Zhumell Z8 f/6 telescopes. 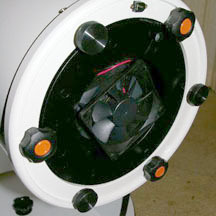 If your primary looks different from our photograph, or already has factory collimation knobs, these knobs will not fit. 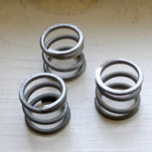 These springs will fit if your primary mirror cell looks like the cell depicted in the photos above. The factory collimation screw length, measured below the head, can be either 25 mm or 32-35 mm. 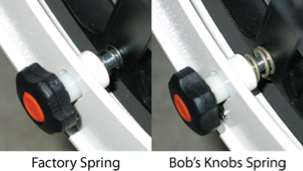 Order knobs with the correct screw length for your application, which is usually 35 mm.